Last January, we wrote about the DoD proposal to streamline the Government's process for approving interim vouchers. We noted that "Streamlining" in this case was a euphemism for effectively removing DCAA (Defense Contract Audit Agency) from the voucher processing business and allows all defense contractors to bypass the auditor when submitting payment requests, regardless of how that Agency views a contractor's billing practices and procedures. That proposal is now final. Under the new rule, DCAA will use sampling methodologies to select interim vouchers for a prepayment review. All others will be "considered provisionally approved and will be sent directly to the disbursing office". Under the old rule, DCAA could authorize contractors to directly submit their vouchers for provisional payment to the disbursing office when DCAA is satisfied that the contractors billing system was "adequate". Of course, it was almost impossible to get an "adequate" rating from DCAA so relatively few contractors qualified for direct billing. Under the new rules, everyone qualifies and the only exceptions are when vouchers are randomly selected for pre-payment reviews. DCAA has yet to publish its sampling methodologies or specify what procedures will be performed in a pre-payment review. When we learn what those are, we will pass it along. We periodically visit DCAA's (Defense Contract Audit Agency) public website to reference the Agency's Contract Audit Manual and to view newly published audit guidance. When we accessed it the other day, we thought something looked a little different. So, since "inquiring minds want to know", we compared the current home page with a cached version. Sure enough, there was something different. 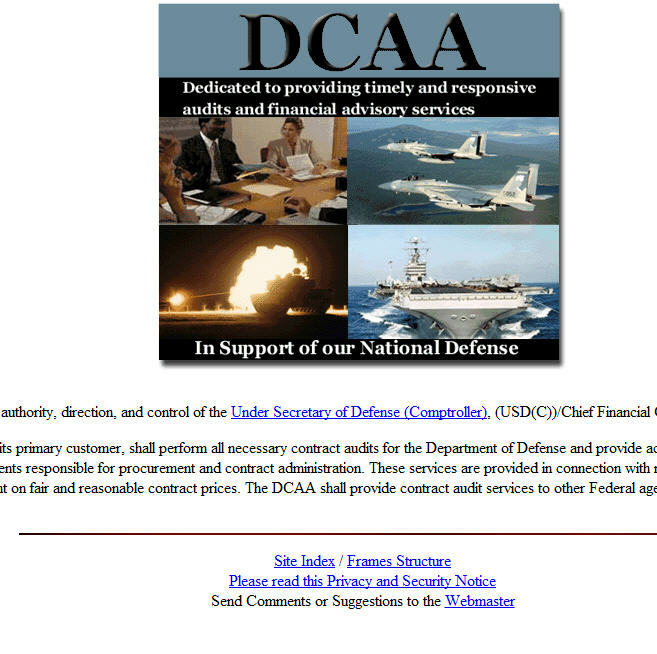 DCAA has added a prominent link for reporting complaints of fraud, waste, and abuse. The link takes you to DoD's Office of Inspector General, the Agency in charge of the DoD hotline. We guess this link is mainly to make it easier for contractor employees to report suspicions of fraud, waste, and abuse as this site is the Agency's public website, they've got another site, an intranet, that its auditors use. This proposed rule will apply to all contractors and subcontractors, regardless of size or business ownership. The FAR Councils do not believe the cost impact of compliance will be significant because first level protective measures are already employed at most locations as part of the routine course of doing business. The Councils believe that the cost of not employing first level protective measures could be very costly to both the Government and contractors if sensitive or valuable information is lost. In this case, the potential benefits greatly outweigh the cost. You can read the full proposal here. Public comments are due by October 23rd. The Comptroller General (CG) recently published a bid protest decision from last May that had been withheld due to a GAO protective order. The protest was filed by an unsuccessful bidder (Phillips) who complained that the successful bidder's proposal (McKesson) was ineligible for award because it was not submitted by the date and time set for receipt of the proposals. The Comptroller General agreed and sustained the protest. The deadline for submission of proposals was noon on December 2, 2011. The Agency (the Veteran's Administration in this case) did not receive McKesson's proposal until an hour after that deadline (1:04 pm, to be specific). McKesson blamed the delay on email and the VA said it was due to an uncommon spelling of the contracting officer's name. The CG held that it is an offeror's responsibility to deliver its proposal to the proper place at the proper time and late delivery generally requires rejection. Similarly, it is an offeror's responsibility, when transmitting its proposal electronically, to ensure the proposal's time delivery by transmitting the proposal sufficiently in advance of the time set for receipt of proposals to allow for time receipt by the agency. While the rule seems harsh, it alleviates confusion, ensures equal treatment of all offerors, and prevents one offeror from obtaining a competitive advantage that my accrue where an offeror is permitted to submit a proposal later than the common deadline set for all competitors. The VA offered a couple of excuses but the CG didn't buy them, mainly because the excuses had no basis in the regulations. Ultimately, the CG ordered the VA to re-compete the solicitation and pay Phillips the cost of appealing the decision including reasonable attorney fees. The Project on Government Oversight (POGO) published an infographic the other day comparing the average CEO compensation at the top five defense contractors to the annual salaries of aerospace and defense industry workers. The average CEO earned an impressive $21.5 million (in, presumably 2010) equating to the total compensation for 268 aerospace and defense industry workers. Fortunately, the Federal government does not pay or reimburse these contractors anywhere close to $21.5 million per year. Executive compensation is capped by statute at $694 thousand for 2010 and $763 thousand for 2011 so most of this compensation comes out of profits or from the contractor's commercial business. POGO did make a good point though; in the event of a sequestration, that level of compensation would preserve a lot of industry jobs. While on the subject of compensation, there is still an amendment pending that would lower the executive compensation cap to the annual salary of the vice president, $230,700. Approximately 80 percent of the Department of Energy's workforce is comprised of contractor personnel who provide services to assist with managing projects and programs. This type of environment, according to DoE's Office of Inspector General, can present unique situations that require special diligence from DoE managers, requiring them to balance support needs with ensuring that applicable Federal regulations and procurement guidelines are followed. Generally, Federal employees are prohibited from becoming involved in contractor employee personnel matters such as hiring and terminating personnel, supervising contractor employees and assigning tasks to contractor employees that, by Federal regulation, can only be performed by Federal employees. In a recently released "Inspection Report", the DoE Inspector General reviewed allegations that a manager at one of its sites tried to influence contractor hiring decisions. In one case, the manager spoke with contractor officials regarding the qualifications and hiring of a particular individual. Although the manager did not order or direct the contractor to hire the individual, the contractor ultimately hired him. In the second case, about two years later, the same manager attempted to secure a position for the same individual at another service contract. That attempt failed when the individual was hired by someone else. The IG found that the manager had taken certain actions on behalf of a particular contract individual but there was insufficient information gathered during the review to indicate that he violated Federal procurement guidelines. Nevertheless, the IG concluded that the actions taken by the manager may have caused others to perceive that the manager acted improperly. direct a contractor to hire a particular individual (but they may provide the contractor with the names of individuals that are competent. Been getting a lot of this lately? 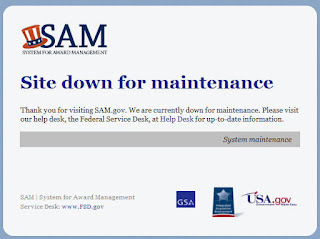 The General Services Administration (GSA) implemented Phase 1 of SAM (System for Award Management) on July 29th. This new system includes the functional capabilities of the retired CCR (Central Contractor Registration, FedReg (Federal Agency Registration), ORCA (Online Representations and Certifications Application), and (EPLS) Excluded Parties List System applications. 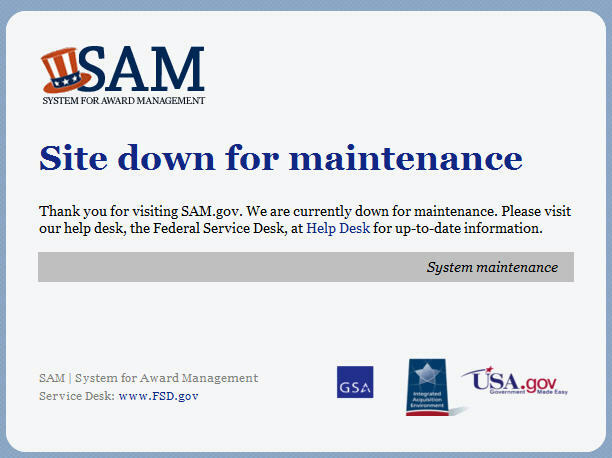 Since implementation, SAM has experienced performance issues that have affected the timely processing of contract awards. GSA says that it has been taking aggressive action to resolve issues with the new system. In the meantime, DoD has relaxed the requirements that i) prospective contractors must be registered in SAM prior to award and ii) contracting officers must check SAM to ensure registration prior to award. Also, GSA has turned back on the old EPLS site to provide contracting officers the ability to ensure a prospective contractor is not actively excluded from procurement actions. The Department of Homeland Security (DHS) is proposing to limit the options available for pricing T&M and labor hour contracts. Look for other Agencies to follow their lead as the concern that contractors are earning windfall profits on T&M contracts continues to proliferate. FAR policy currently provides that T&M (and labor hour) contracts can be priced using a single set of rates (composite rates) for a prime contractor and all of its subcontractors and affiliates, or to require separate rates for the prime contractor and each of its subcontractors and affiliates. FAR also states that individual agencies can make the use of separate rates mandatory (see FAR 16.601(e)). DHS wants to make the use of separate rates mandatory. Under its proposed regulation, offers will be required to submit offers that include separate labor hour rates for subcontractors and affiliates. The purpose of this proposed procedure is to ensure appropriate labor hour rates are paid under T&M/labor hour contracts and orders. "The procedures are intended to eliminate unintentional windfall payments to the prime contractor that might otherwise result from work performed by lower labor rate subcontractors or affiliates that is billed at a higher prime contractor labor hour rate. Last Friday, we wrote that the Government (namely DCAA) had formulated a new policy on requesting internal audits and associated working papers from Government contractors. We also noted, based on our experience, that contractor internal audits were not all that useful in reducing the amount of work necessary by Government auditors when evaluating the various business systems that are important for ensuring the propriety of costs charged to Government contracts. Yesterday, we discussed the impetus behind the new policy, the GAO report that to some extent, disagreed with our experience, namely that there was a lot of useful information in internal audits that could be useful to a Government auditor. We remain unconvinced. If there was such good information in these reports, if DCAA could really use them to reduce the level of their own oversight, the Agency would have been much more aggressive over the years in obtaining them. Today we will conclude this short series with a recap of the new policy. First of all, everyone acknowledges that DCAA cannot request unlimited access to all internal audits - there must be something there that is relevant to its audit responsibilities. The GAO found that, for the most part, DCAA didn't even know what was even out there, making it difficult to assess whether a report was or was not relevant to the audit mission. So, the first step is to set up focal points to monitor contractor internal audit activity, make requests for copies of the reports and working papers, and track these requests to ensure contractor responsiveness. Auditors and supervisors are now required to review the listing of internal audits to determine whether any apply to their specific audit assignment. If so, the established point of contract will obtain and provide the auditor copies of the report and possibly the working papers. The auditor is to review the report and determine if sufficient information is contained in the report for use in identifying risk in audit assignments. In order to make such a determination, the auditor will need to understand the scope of the internal audit, the reported deficiencies and any recommended corrective actions. If that information is not in the report, the auditor will ask to review the working papers. If contractors refuse to provide requested audits, the new guidance requires that the auditor elevate the denial as an "Access to Records" issue. At the conclusion of the audit, the auditor is required to provide feedback to the point of contact regarding the usefulness of the internal audit. Last Friday, we reported on DCAA's recently revised audit guidance related to accessing contractor internal audit reports and related working papers. Essentially, the revised guidance was a result of a GAO report from last December (see GAO-12-88 dated December 8, 2011). GAO looked at seven defense contractors to assess their compliance with standards for internal audits, the extent to which those companies' internal audit reports address defense contract management internal controls, and DCAA's ability to examine internal audits and use information from those audits. GAO found that the internal audit departments did a pretty good job of adhering or complying with professional standards and that those audits covered a broad spectrum of policies, business systems, and programs that are relevant to DCAA audits. GAO discovered however, that those seven contractors had widely varying policies for providing DCAA access to those reports. Some provided access on a case-by-case basis, some upon request and one, not at all. GAO found that the number of internal audits requested by DCAA is very small relative to the number of internal audits that GAO identified as relevant to the Government contracting oversight process. In explaining why so few reports were requested, auditors noted that there was uncertainty as to how useful those reports could be to their own oversight (a point we made earlier). GAO recommended that DCAA take steps to facilitate access oto internal audits and assess periodically whether other actions aqre needed. DCAA generally agreed to implement GAO's recommendations but expressed skepticism that these recommendations alone would fully ensure access to internal audits. In a related matter, Sec 843 of the National Defense Authorization Act of 2013, if enacted, will put some statutory teeth to accessing internal audits. The proposed legislation will (i) require that assessments of contractor business systems take into account the "efficacy of contractor internal controls, including contractor internal audit reports and supporting materials that are relevant to such assessment and (ii) provide that the refusal of a contractor to permit access to contractor internal audit reports and supporting materials that are relevant to such an assessment is a basis for disapproving the contract business system to which such materials are relevant. Disapproved business systems will result in billing withhold and cash flow disruptions. Tomorrow, we will discuss some of the specifics of DCAA's new policy on accessing internal audits. DCAA significantly revised its audit procedures for accessing internal audit reports and associated working papers of contractor internal audit departments. The latest guidance can be found in the Contract Audit Manual at 4-200. While acknowledging that internal (and external) auditors' final audit objectives are not the same as DCAA's the information contained in their reports may be useful to DCAA in the course of its audits. DCAA further stated that auditors should be aware of the potential for increased opportunities in reviewing these audits as part of their audit responsibilities (whatever that means). The theory is good. Internal audit departments, like Governmental audit activities, are concerned about the effectiveness of internal control systems. To the extent that DCAA or other Governmental audit organizations can rely on the work performed, they can reduce the level of their own oversight. The problem is that there is a big gap between theory and reality. As we've stated here before, we have a lot of experience reviewing internal audit plans and reports and there just wasn't much there that was of any use in helping us reduce the scope of our own audit activity. The control objectives most important to contractors are not the control objectives most important to Government auditors. When we were auditors, access was not usually an issue. We would sit down with the internal auditors annually, review their plans, look at a few reports that, on the surface, sounded like something we might be interested in. But this was all more of an intellectual exercise rather than one that proved useful. This didn't change when Sarbanes-Oxley came along either. The notable exception came one year when both the contractor's internal audit department and DCAA planned to review the purchasing system. We consolidated audit programs and divided up the procedures and consolidated the results into one report when finished. In retrospect, that worked pretty well but in today's environment, with acute emphasis on independence, the practice is no longer acceptable. The attorney-work-product doctrine protects documents and other memoranda prepared by an attorney in contemplation of litigation. Such documents include private memoranda, written statements of witnesses, and mental impressions of personal recollections prepared or formed by an attorney in anticipation of litigation or for trial. As its prupose is to protect the adversarial trial process by insulating the attorney's preparation from scruitiny, the work-product rule ordinarily does not attach until at least some claim, likely to lead to litigation, has arisen. Courts have also accorded work-product protection to materials prepared by non-attorneys who are supervised by attorneys. Contractors sometimes invoke the attorney-client privilege in refusing to provide requested documents to auditors and other Government agents. But auditors are a questioning lot (as they should be) and often suspect that such claims may not be substantive. If a contractor asserts the attorney-client privilege or the attorney-work-product doctrine, DCAA guidance requires the auditor to request the contractor to explain two things and they will request the explanation in writing. why the contractor cannot provide the requested information or some alternative, non-privileged information that will meet the auditor's needs. If the auditor is not satisfied with the above written explanation, the denial may be escalated into an access to records issue. That's never a good thing and should be avoided where possible. Contractors should look for ways to support the propriety of costs charged to Government contracts by other means, if possible. Examples of non-proprietary data that may be useful include filings with a court that are available to the public, contractor's summaries of data, other public filings, etc. Many contractors employ in-house legal counsel. We recall a situation where a contractor took the position that everything the in-house counsel did was protected from disclosure to the Government. That position did not hold up too long when it was pointed out that counsel was involved in reviewing solicitations, proposals, and contract files among his other duties. Unless there is litigation, pending litigation, or a situation likely to lead to litigation, success in asserting attorney-client privilege as a basis for denying access to records will be limited. Where there are legitimate concerns, contractors should work with the Government to find ways of satisfying their requirements without having to disclose privileged data. Generally, Government contracts contain a changes clause that permits the contracting officer to make changes to a contract. Changes can be categorized into unilateral changes and bilateral changes. Some changes are purely administrative. Administrative changes are unilateral written changes that do not affect the substantive rights of the Government or the contractor. For example, a change in the point of contract, telephone number, or paying office address are administrative changes that would not likely affect costs or other rights of the contracting parties. Change orders are also unilateral changes that direct contractors to make a change authorized under the "changes" clause of a contract. Most contracts have a changes clause, either FAR 52.232-1 for fixed price contracts or FAR 52.232-2 for cost type contracts or FAR 52.232-3 for time and material contracts. Change orders usually result in an equitable adjustment. See FAR Part 43, Contract Modifications, for regulatory coverage of contract modifications. Who Manages the Daily Operations of the Business? Last week, the Department of Justice announced a guilty plea involving a business owner who falsely claimed minority and service-disabled veteran status for his business. Sentencing comes later but could result in five years in prison, followed by three years of supervised release and a $250 thousand fine. The business owner (and a co-conspirator) falsely represented that a minority and service-disabled veteran owned and managed the daily operations of the business. They arranged the charade in order to obtain federal Government contracts that were set aside for, or preferentially awarded to, disadvantaged minority and service-disabled veteran-owned and operated businesses. These kinds of cases are becoming more frequent. Although the DOJ press release does not disclose how the fraud was disclosed, many other cases have come about through disgruntled, envious, or conscientious employees or insiders. Another recent case involved an ostensibly woman-owned business whose husband, for all intents and purposes, ran the company. Still another involved a minority-owned business used as a front for a large company. The goal in all these schemes is to get Federal government contract awards that were set aside for small, disadvantaged, service-disabled veteran-owned businesses. The common denominator in these cases is that the qualifying business owner did not materially participate in the day to day management and operations of the business. Over the next few months, we'll be hearing a lot about the possibility of a sequestration that will arbitrarily cut $110 billion out of next year's spending; half from defense and the other half from all other spending. One of the frustrations for Government contractors is the uncertainty that the cuts might have on their programs. Last week, we wrote about one of those uncertainties with respect to whether provisions of the WARN Act apply. Also last week, the President signaled that the military will be exempt from sequestration cuts (good for the military but that means other spending will get hit harder). Also last week, the President signed a law (the Sequestration Transparency Act of 2012) that requires the Executive Branch to detail by September 6, where the spending cuts would take place. (The bill passed both the Senate and House unanimously meaning that the President more or less had to sign it or face a veto override). The report to Congress required by the Transparency Act should provide a pretty good idea where cuts are likely to come from, in the event of a sequestration. The Act requires a fair amount of reporting specificity including reductions at the program, project, and activity level. The report must also identify all exempt discretionary accounts and all exempt direct spending accounts. By September 6th, we should have a pretty good idea of who's ox is going to get gored if there is a sequestration. Underbidding Can be a False Claim? The U.S. Court of Appeals for the Ninth Circuit issued a decision in US ex rel. Hooper v. Lockheed Martin Corp (No. 11-5528) last week, reversing a lower court decision, in which a "qui tam" whistleblower (Hooper) alleged that the contractor (Lockheed) had fraudulently underbid and/or relied upon false estimates to obtain a government contract. A district court had previously sided with Lockheed and Hooper appealed. Lockheed argued that allegedly "false" estimates cannot be the basis for liability under the FCA (False Claims Act) because an estimate is a type of opinion or prediction, and thus cannot be said to be a "false statement" within the meaning of the FCA. Specifically, Lockheed argued that "estimates of what costs might be in the future are based on inherently judgmental information, and a piece of purely judgmental information is not actionable as a false statement". The Ninth Circuit Court felt otherwise. After the Air Force rejected one of Lockheed's bids, Lockheed went back to the drawing table to revise it. The Court noted that Lockheed management had instructed its employees to lower their bids without regard to actual cost. When one employee (Hooper) protested, he was cut out of the bidding process. Ultimately, Lockheed cut its initial bid in half and was awarded the contract. The Court stated that there was a genuine issue as to whether Lockheed had actual knowledge, deliberately ignored the truth, or acted in reckless disregard of the truth when it submitted its allegedly false bid. The Ninth Circuit reversed and remanded the district court's dismissal of Hooper's claim that Lockheed violated the FCA by knowingly underbidding the contract. "Having determined that FCA liability may be premised on false estimates, we hold that there is genuine issue of material fact whether Lockheed acted either knowingly in a deliberate ignorance of the truth, or in reckless disregard of the truth when it submitted its bid for the ...contract". This is dangerous ground for contractors. A preaward survey of a prospective contractor's accounting system is an examination of the accounting system before contract award. The audit scope is limited to obtaining an understanding of the design of the prospective accounting system so as to appropriately complete Standard Form 1408, "Preaward Survey of Prospective Contractor Accounting System" and those procedures essential to reach an informed opinion on whether or not the design of the prospective contractor's accounting system is acceptable for accumulating costs under a Government contract. DCAA recently revised its guidance by limiting audits of prospective contractor accounting systems to only those that are in operation or set up but not in operation. Previously, DCAA would also assess accounting system that were "anticipated" or "nonexistent" (e.g. the prospective contractor does not currently have an accounting system but, if awarded the contract, will implement this or that). DCAA explains that it is not possible to perform an examination level engagement under circumstances where an accounting system is anticipated or nonexistent (despite what the SF 1408 states). 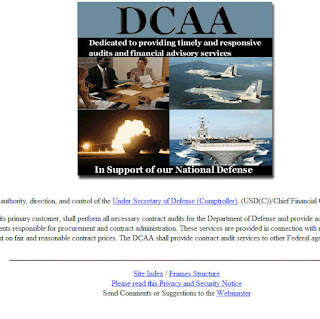 And DCAA is correct. If requested to perform an audit for an accounting system that is either anticipated or nonexistent, the auditor will notify the requester that DCAA will be unable to provide an audit report or SF 1408, but will be available to once the system is set up or in operation. This change is audit guidance will have ramifications for prospective contractors that do not currently have accounting systems but would be more than willing to implement one, if and when they get a Government contract. Those companies do not want to incur the time and expense necessary to implement a complaint system if the prospective contract is awarded to another firm. Under the previous guidance, DCAA could complete the SF 1408 based on "inquiry" with (sometimes) a recommendation that a follow-up audit be requested after contract award. Under DCAA's new policy, the Agency will refuse to perform an audit or complete the SF 1408 which means that more prospective/potential contractors may be disqualified from competition for lack of an adequate accounting system. such insurance does not cover loss, damage or destruction which results from willful misconduct or lack of good faith on the part of any of the contractor's management personnel. The clarified guidance now reads: "Where the risk of loss is not the responsibility of the contractor, or the contracting officer has revoked the Government's assumption of risk, or the insurance covers loss, damage or destruction resulting from willful misconduct, etc., the cost of purchased insurance coverage or self-insurance (including the contractor's deductible) should be questioned." This guidance seems very straight forward, however implicit in the guidance, is the expectation that the auditor will review Government-property records, insurance documents, and other relevant supporting data in order to make such a determination. Contractor's that have insured Government-owned property and have claimed (or plan to claim) the cost of the insurance premiums, should be prepared to demonstrate to the auditor that i) it is responsible for any losses to Government-owned property, and ii) the premiums do not cover loss, damage, or destruction resulting from willful misconduct or lack of good faith. This could be tricky. In the context of the Federal Acquisition Regulations (FAR), the terms "cost reasonableness" and "cost realism" have very different meanings and purposes. It is easy to confuse the two similar sounding terms and some bidders have even appealed contract awards before the Comptroller General based on a lack of understanding between cost reasonableness and cost realism (or price reasonableness and price realism). The purpose of a cost reasonableness review in a competition for the award of a fixed-price contract is to determine whether the prices offered are too high, as opposed to too low. The purpose of a cost realism review in a competition for the award of a cost-type contract is to determine whether the prices offered are too low. In a cost-type environment, estimated costs are not dispositive, because regardless of the costs proposed, the Government is bound to pay the contractor its actual and allowable costs (see FAR 15.605(d)). A price realism analysis determines the extent to which an offeror's proposed costs represent what the contract should cost, assuming reasonable economy and efficiency. "Sequestration" is one of the hottest political issues in Washington. It is a term for mandatory cuts to federal programs, the process of cordoning off money that may have been authorized by Congress but is now prohibited from being spent. The Government is facing one of the biggest sequestrations of all time - $600 billion out of Defense and another $600 from domestic programs. This sequester came up last year as part of the debt limit law as punishment for not coming up with a plan to cut the deficit. If sequestration kicks in next January, there will be significant program cancellations and curtailments which could lead to plant closing and/or significant layoffs. The WARN Act (Worker Adjustment and Retraining Notification Act) applies to employers with 100 or more employees and requires employees be provided with a 60-day advance notice when a plant is to be closed or there is to be a mass layoff. There has been concern raised as to whether the WARN Act requires Federal contractors, including, and in particular, DoD contractors whose contracts may be terminated or reduced in the event of sequestration on January 2, 2013, to provide WARN Act notices 60 days before that date to their workers employed under Government contracts. The Department of Labor (DOL) is the Agency responsible for implementing and enforcing the WARN Act. Last week, DOL issued guidance that emphatically stated that Government contractors are not required to provide WARN Act notices 60 days before January 2, 2013, in anticipation of a potential sequestration order that could be issued on that date. The guidance explains that such notices would be inconsistent with the purposes of the WARN Act. This DOL guidance might be different than you've read elsewhere. Some contractors are considering issuing WARN Act notices anyway, as a precaution, Perhaps there is merit to that position. The Northrup Grumman CEO in responding to the DOL guidance stated: "... but I think simply saying you don't have to do it is perhaps not a fully considered position when it comes to recognizing the force of law". One source reported that DOL " ... is not the sole entity in charge of making this determination." and you need to watch out for DCAA (Defense Contract Audit Agency) who might disallow severance payments, termination costs, and plant closures barring a WARN Act notice. 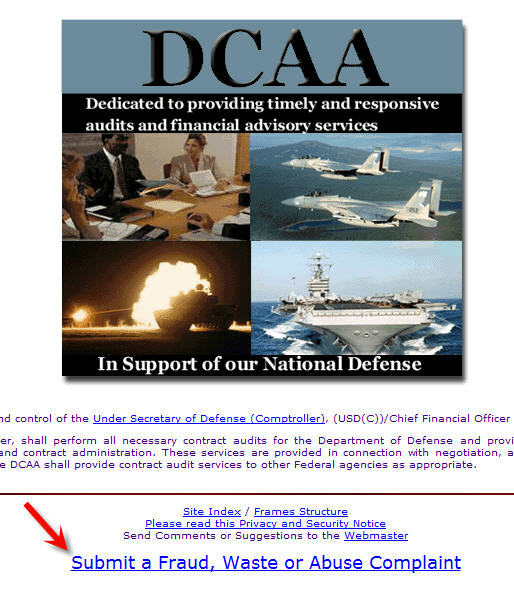 We think that probably overstates DCAA's authority in light of clear guidance from DoD (who posted the DOL guidance on their Policy website). Service and warranty costs include those arising from fulfillment of any contractual obligation of a contractor to provide services such as installation, training, correcting defects in the products, replacing defective parts, and making refunds in the case of inadequate performance. When not inconsistent with the terms of the contract, service and warranty costs are allowable. However, care should be exercised to avoid duplication of the allowance as an element of both estimated product cost and risk. There are several accounting methods used to account for warranty costs. Some contractors charge such costs direct to a contract or other final cost objective. Others charge warranty costs to one or more of their indirect cost pools. Still others, set up balance sheet reserve accounts and amortize the liability. With the reserve account methodology, contractors must make periodic comparisons to actual cost and adjust the accruals or book the variance. DCAA has written fairly extensive guidance for reviewing warranty costs. Most of it cautions auditors to make sure that contractors do not "double dip" meaning that they cannot charge costs direct in some cases and indirect in others. Contractors who incur warranty costs or price warranty effort in their proposals would do well to study the guidance found in the DCAA Contract Audit Manual , Section 7-1600. When we see a caption like "other business expense", we think of a catch-all category for costs that do not fit into some other pre-defined category. Its kind of like "miscellaneous costs" - if you don't know what else to do with an expense item, charge it "miscellaneous costs" (By the way, auditors love to analyze charges to "miscellaneous costs"). The FAR cost principles has a category called "other business expenses". It is found in FAR 31.205-28. Preparing and publishing reports to shareholders. All of the foregoing activities are allowable under Government contracts. The Government will sometimes try to classify these types of activities as "organization costs" which are generally unallowable (see FAR 31.205-27). Such a position is easily refuted if one knows about this cost principle. An old ASBCA case illustrates one of the distinctions between allowable "other business expense" and unallowable organization costs. In ASBCA No. 14370, the board held that fees incurred by Boeing in connection with the conversion of its convertible debentures into common stock and a stock split to make its securities more marketable were allowable as other business expenses because the transaction did not raise any new capital and there was no change in Boeing's corporate structure. Today we are finishing up our discussion of patents, royalties, and related costs. Essentially, if patents are required by your contract, you can claim the costs. If you must go out and pay royalties to support your contract, you can claim the royalty costs as an expense. Because patents and royalties are often contentious areas between contractors and the Government, FAR 31.109(h) lists royalties and other costs for use of patents as an example for which advance agreements may be particularly important. Advance agreements are used when the reasonableness, the allocability, and the allowability under the specific cost principles (i.e. FAR 31.205) are difficult to determine. To avoid possible subsequent disallowance or dispute, contractors and the Government are encouraged to seek an advance agreement on how such costs will be treated. This effectively takes the auditor our the the determination process. FAR 31.205-47, costs related to legal and other proceedings, is also relevant to our discussion on patent/royalty costs. The cost of patent infringement litigation are unallowable (unless, of course, provided for in the contract). This means that the Government is happy to use your patents but it will not pay to help defend those patents. I guess the logic here is that there is no adverse consequence to the Government when someone violates a contractor's patent rights. The final aspect of this subject we want to highlight is the requirement to document your costs. Many costs related to patents fall under the broad category of professional and consultant service costs (FAR 31.205-33). That cost principle requires specific documentation to support the allowability; consulting agreement, invoice, and work product (or evidence of services rendered). Be sure that when you claim costs associated with patents, you also maintain the basic documentation required by this cost principle.